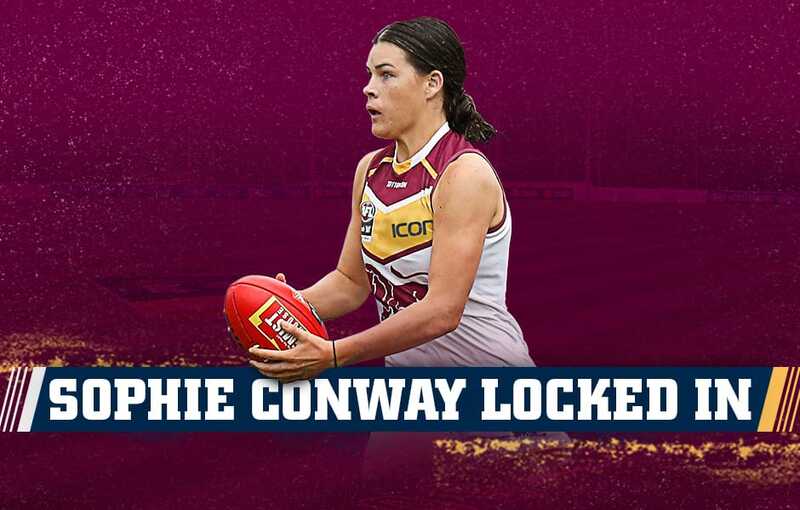 2018 AFLW Rising Star nominee Sophie Conway cannot wait to repay the Lions’ faith in her, after she re-signed for another two seasons. Conway took the AFLW by storm in her first season with her accurate boot in front of goal. Sadly, she missed the entire 2019 season after rupturing her ACL in the off season. The 20-year-old, former Hyundai Help for Kids Academy graduate, said she is itching to get back out there. “I’ll be forever in debt, especially to the medical team, along with Craig and Bree,” she said. “I’m so grateful to be offered a new deal and I’m really keen to repay the favour. “The medical team have been with me every step of the way in my recovery and it’s comforting to know that next year I will be in an environment with people that I know and trust. Lions Women’s CEO Breeanna Brock credited Conway’s resilience in a difficult time. “Her application to her recovery has been second to none,” Brock said. “We are confident that when she gets back on the track with that same application she’s going to be bigger and better than ever. The AFLW Sign and Trade Period will end on Thursday 18 April.